Last week, we clarified Food Allergy vs Food Intolerance which gave an overview of the differences between the two. 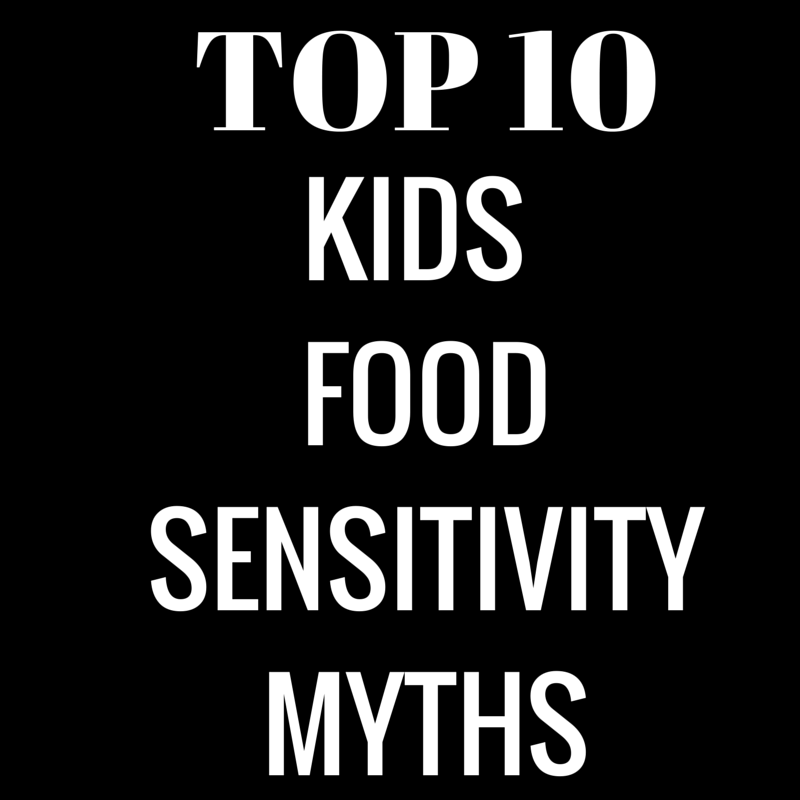 Today we can put this to test by tackling these Kids’ Food Sensitivity Myths! Myth #1: This Food Doesn’t Agree with Me, I’m Allergic to It! This actually reminds me of my hubby (lol), most times we don’t agree (that is when we actually talk!) but no, I’m not allergic to him (hopefully he thinks the same!). As explained in last week’s post, food sensitivity can be either in the form of allergy or intolerance. Some doctors also allow for a 3rd category of food sensitivity, when they can’t classify it as either an allergic reaction or find the chemical the body is intolerant to. However, these days, there’s almost a ‘cool’ factor to say you’re allergic to something. So while it is possible that more people think or say they have an allergy than they really have, food intolerance/sensitivity may also be underestimated as they are hard to diagnose. Do note too that adults can also have an onset of allergy at an older age, esp for certain allergy like shellfish. There are many IgG tests available online and generally the medical community is against this test for identifying food sensitivity. The main reason is that elevated IgE implies an exposure to the food rather than an allergy to the food. Also while 80% of the foods are the common suspects in allergy, IgG test may test hundreds of foods and with false positives, lead to harmful elimination diet. For some individuals the same foods can trigger both food allergy and intolerance. For instance, there can be an allergy to the milk protein while also lacking lactase digestive enzyme to break down lactose. This is why it is important to consult a specialist as it is not easy to figure it out on your own. This falls back to last week’s explanation of food allergy and intolerance. For severe food allergy, smelling the food can trigger a reaction, and it can be fatal one like anaphylactic reaction (that’s why there is so much debate about peanuts on plane!). However, for food intolerance, some people can eat certain amounts or in certain forms, e.g. food cooked with milk (I tried this fish recipe before, tasted horrible!) may give a different reaction to drinking milk. Myth #5: I feel Bloated, I’m Allergic! Bloating is more closely related to food intolerance but eating gassy foods cause bloating too. Pregnant women suffer more from bloating and constipation due to pregnancy hormones leading to relaxation of gastrointestinal wall muscles, thus foods stay in the tract longer. Myth #6: I didn’t eat the food, how can I be allergic to it? Food sensitization is when the body first comes into contact with the food protein and the body then ‘tag’ it as an enemy. The next time even small amounts of the food (in some cases, touched or smelled) can trigger an allergic reaction. So smelling peanuts on plane, touching or shaking hands with another child with peanut butter trace on hands can lead to an allergic reaction. Based on updated studies, the recommendation to delay introduction of common food allergens (usually peanuts, tree nuts, shellfish) is now revoked. The studies were contradictory – some showed late introduction helped as the child’s immune system is stronger while others showed early introduction helped as the child builds an immunity to it earlier. Thus the current recommendation is Just Eat (Whatever) a Balanced Diet. An update on a study on early introduction of eggs done in August 2015 showed that the elevated immune responses to egg were established prior to egg ingestion at 4 months and were not affected by whether eggs were introduced early. Allergy testing (skin prick and IgE) is fairly accurate but not 100%. The only gold standard in food allergy testing is the oral food challenge. However due to the difficulty of conducting the oral food challenge (involves hospital stay), doctors form a diagnosis based on corroborated ‘evidence’, for instance the test results, parents’ observations and doctor’s knowledge of food allergens, family history. Organic foods (only the properly certified ones) may be safer in terms of free from pesticides but not safer in terms of allergic reaction to the food protein. Organic or not, the food protein is still present. For some people, peeling the fruit’s skin or cooking in a different way may help. Allergy testing only tells you if you have an allergy, but it cannot predict the severity of the reaction. For instance, (see this previous post), the size of the wheal from skin prick test does not correlate with the reaction you will have.